We are keenly aware of the fragility of environment and cultures in which we trek and recognize our responsibility in maintaining them. “Take pictures, leave only foot prints” is our motto. 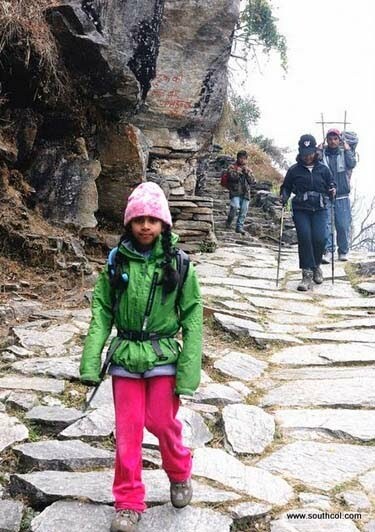 Families with children are especially invited to come- Sujoy’s past treks have included Anamika 7 years, Prithvi 9 years and Yuvraj 12 years, all of whom successfully climbed upto 3000 metres! Seen on the right is Romina walking down from Ghandrung village in winter December 2007! In April 2011, South Col trekked with four children to Thyanboche monastery in the Everest Region!